From a kid with a training wheel-equipped, royal blue, banana seat bicycle, to the 2001 World Mountain Bike Championship, Alison Dunlap has never ignored her dad’s advice when he told her "don’t stop pedaling!" It was advice that has taken her beyond an early initial interest in soccer and gymnastics to become one of the elite among female cyclists. Alison Dunlap has always maintained an intense interest in sports. Her early involvement with soccer in her freshmen year at Colorado College left her looking into other options when she became the last team player cut from the Division 1 powerhouse. A life-long interest in cycling resulted in her becoming the only female member of the school cycling club. It was a perfect fit and the die was forever cast when she became the woman’s national road racing collegiate champion her senior year. She was hooked. Five years later found her at the 1996 Atlanta Olympic Games in the women’s road race where she finished 37th. While contemplating retirement she began to realize that despite being burned out on road racing she still loved the sport. It was when she began dating professional mountain biker, Greg Frozley (now her husband), that she realized her untapped potential as a mountain biker. Their personal relationship, combined with his involvement in the mountain bike scene, further nurtured her interest. A new love was born. Soon followed a sponsorship with GT Bicycles, helping launch her ascent into the world of the mountain bike elite. In 1997, in only her 4th World Cup, she stunned everyone by winning the race in Budapest, Hungary. Then in 1999, Alison won her second World Cup, a gold medal at the Pan-Am Games and became the U.S. National Champion. She was the number one ranked US rider and finished the season ranked second in the world. Since then she has won twelve more national titles, a World Cup Overall, a World Championship, and raced in her second Olympics in Sydney, Australia. After a short four year retirement, Alison came back in 2009 and raced cyclocross for LUNA. “I realized I missed the excitement of racing, but I also knew that I didn’t want to come back full-time. Cyclocross was a good choice; the season is short and I had spent seven years previously racing cross and knew I loved it.” After getting 4th at the National Championships, it was back to retirement, thanks to a very exciting new development; the birth of her son Emmett Dunlap Frozley! In 2017, Alison will continue working as a USA Cycling certified Level I coach with her coaching company www.alisond unlapcoaching.com. Four years ago she recieved her Professional Mountain Bike Instructor certification out of Whistler, BC. 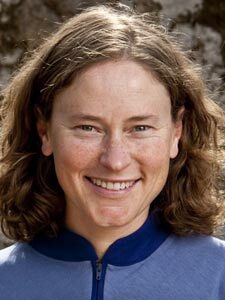 This year marks her 12th year on the USA Cycling Olympic Selection Committee and her 12th year as a certified Wilderness First Responder. Most recently she was inducted into the US Bicycling Hall of Fame. Alison is a graduate of The Colorado College with a BA in Biology and currently lives in Colorado Springs with her family. My name is Stephanie Surch, but in the cycling community I'm better known as "Robbie Spokes" (or "Aunt Robbie" to Alison's son Emmett). I've been assisting Alison with her camps and clinics since 2013. I've been riding mountain bikes for 27 years, developing my skills on the rocks, roots, and dirt of my native Pennsylvania. In addition, I spent 14 years racing BMX, including seven years as a professional, and always attest that skills acquired in BMX have helped me become an experienced mountain bike rider. Over the years, I've competed in dozens of endurance mountain bike races, including the Leadville 100 and many other long distance events. Since moving to Colorado in 2011, I've had the wonderful opportunity to become involved in the ever-growing cycling community in Colorado Springs. In addition to assisting ADAC, I am a ride leader for the Women's Mountain Bike Association of Colorado Springs, serve on the Doard of directors for Kids on Bikes, and am a board member for the city's Active Transportation Advisory Committee. I work full-time on the sales floor and as a mechanic at Criterium Bicycles in north Colorado Springs. I'm a certified bicycle fitter, and am also a certified bicycle mechanic, graduating last year from United Bicycle Institute in Ashland, Oregon. In addition, I am a USA Cycling level 3 coach. Mountain biking is truly my passion, and I enjoy instructing riders at all levels. It is a joy to work alongside Alison in helping each rider learn new skills and have fun! I started riding mountain bikes in the 80's and plan to be riding well into my 80's! I remember buying my first mountain bike and the shop owner telling me mountain biking was just a fad that would quickly fade out. Needless to say, he's no longer in business and I'm still riding! My first bike was fully rigid, had 7 gears, weighted over 30 pounds and, because they didn't know how to fit a person to a mountain bike, several sizes too large. But I loved my bike. Trips were planned around destinations which at that time were not known for biking but were just great places to go. Moab 's Slickrock Trail had few riders and parking for the trailhead was alongside the road in the ditch. I remember a trip to Crested Butte one July in which the town was so deserted the lodge owner rented us a room for $25 a night just to have some business. Times have certainly changed but my love of riding has not. While I rode often it wasn't until 2007, when I took a weekend clinic from Alison and her husband Greg, that I learned how you're supposed to ride a mountain bike. I was totally amazed as I watched Alison and Greg ride effortlessly up and down different trail obstacles and excited when they had us try the same. No, I didn't master all of the skills they introduced over the weekend, but it gave me enough confidence to continue practicing and to work toward improving my skills. Today I'm still working on my skills and I thoroughly enjoy helping others do the same. I've attended various skills clinics, became a ride leader with the Women's Mountain Biking Association of Colorado Springs, have led various trips to Arizona, Utah and Colorado, and obtained my Level One certification with the Professional Mountain Bike Instructors Association. Biking has greatly enhanced my life and I hope you'll join us for an instructional fun filled weekend! After learning how to ride in the unlikeliest of places while living in Indiana, I have been riding for seven years and am in my third year of racing and coaching. I first picked up a mountain bike to train for an off-road triathlon, and was frustrated and terrified while trying to learn from the guys. Fortunately, I found a women’s mountain bike clinic that year and became hooked on the process of learning bike handling skills and gaining more confidence. I am an Alabama native who found my home in Colorado Springs with my husband Luke and dog Willow. I race and lead rides for the Women’s Mountain Bike Association of Colorado Springs. I am also an IMBA Level 2 certified mountain bike instructor.